Cool facts about 7 Earth-size planets circling single star. 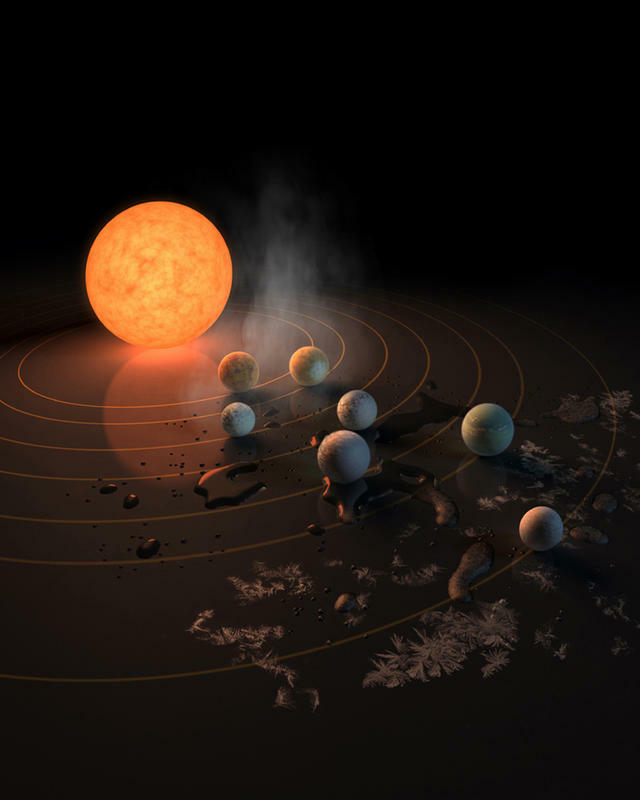 This artist’s concept appeared on the Feb. 23, 2017 cover of the journal Nature announcing that the TRAPPIST-1 star, an ultra-cool dwarf, has seven Earth-size planets orbiting it. Any of these planets could have liquid water on them. Planets that are farther from the star are more likely to have significant amounts of ice, especially on the side that faces away from the star. This article was featured on Yahoo News today. I find that interesting, almost an answer to a question I’ve harbored most of my life. I wondered about visiting the other planets. But until we began depleting the resources we have here, the notion of moving never crossed my mind. Just during the past few months NASA got on board. If such a thing ever came to pass who would go – the young, the geniuses, the physically fit? Not everyone would qualify to participate. What about those couldn’t go? Would those left here to live out their years on a burned out hulk?